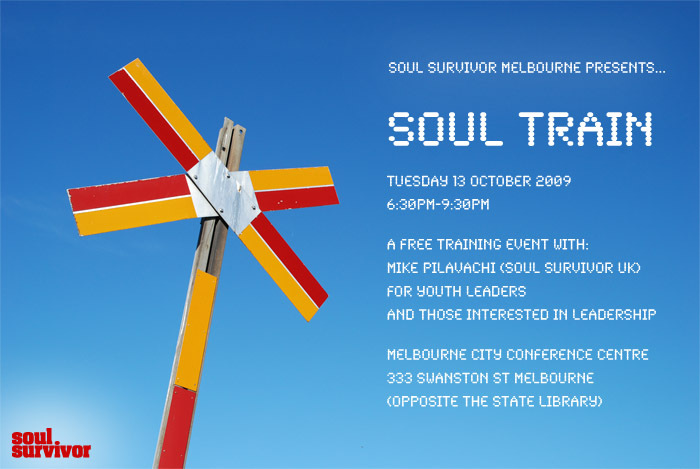 Some of you would be aware that both Rebecca and I are involved in Soul Survivor Melbourne, and Soul is putting on an event for youth leaders and anyone interested in youth leadership. Basically, Soul Survivor UK head Mike Pilavachi (who is tweeting here if you’re so inclined) is out for the night, and it’s a great opportunity to hear from and pick the brain of someone with an enormous collection of experience in youth ministry. Plus it’s free and there’s likely to be some food, so what have you got to lose. 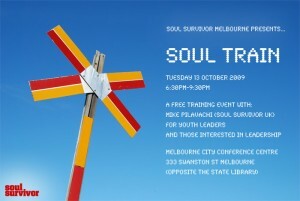 Melbourne City Conference Centre, 333 Swanston St Melbourne (Opposite the State Library). Thanks for your attention, you can now expect a return to your regular service of advertisement free, mindless drivel. Thanks Cat! Will definitely have to check that one out. Next PostNext What if the rest of the world gets it?